Most screenplays are doomed to fail from page one. The culprit? Bad story DNA. Mariner Software’s Contour 1.1 story development software helps screenwriters develop a structurally sound movie blueprint that meets Hollywood studio development department standards and satisfies moviegoers. By bundling a proprietary story structure methodology (which you might traditionally find in a screenwriting how-to text) with a software toolset, Contour enables screenwriters to craft a pretty solid outline, even if they lack knowledge of basic movie storytelling theory. Ever since Aristotle first described three-act structure more than two thousand years ago, story gurus have dreamed up paradigms trying to explain what makes a successful narrative tick. And screenwriters and studio execs alike have flocked to these methodologies, seeking a better understanding of what makes a movie work. 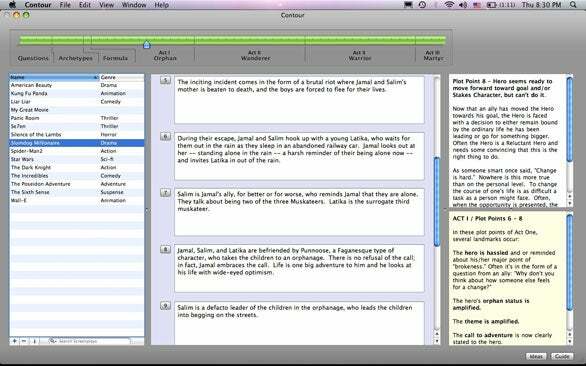 Several popular screenplay-formatting apps have added outlining tools that allow writers to organize their story chunks according to these theories. But typically, they require the user to already have a solid grasp of screenplay structure theory. Not Contour. Contour works much like a software install wizard, asking the user to answer simple questions, constructing the foundation for a feature film in the process. Be aware: Contour is not screenwriting software. Contour 1.1 focuses purely on story development. Once you have your outline ship-shape, you will need to begin writing your screenplay in earnest in a separately purchased word processor or screenplay formatting program, such as Mariner’s Montage ( ), Final Draft ( ), or Movie Magic Screenwriter ( ). The bad news is that means spending more money. The good news is that by separating the outlining tool from the screenplay-formatting tool, Mariner Software makes the Contour methodology available to a wider base of writers. So if you already own script software, there’s no need to give up the app to which you’ve grown accustomed. Contour’s user interface is clean and straightforward, putting about every function you need on the main screen. There’s not much additional functionality buried in the menus, which makes it very easy for a new user to jump right in to using the software. The primary interface window features a screenplay list pane on the left side, displaying not just your personal outlines in process, but also more than a dozen sample blockbuster outlines that are provided with the software. Sure, there’s something exciting about seeing your screenplay title sandwiched between Silence of the Lambs and Slumdog Millionaire. But beyond that, having those examples at your fingertips can be very useful when you have writer’s block. Let’s say you’re having difficulty determining what should happen at the midpoint of your movie’s second act. Just click on any sample screenplay title, and Contour will take you to the same point in that story, so you can see what has worked in other successful films. The principal tool for getting around your outline is the Progress Bar at the top of the screen. As you answer questions in the wizard-style content pane (with explanation and examples provided screen-right), that step on the progress meter becomes green, and you advance to the next step. Too often writers dive into a story before they really know what it’s about. Contour’s Progress Bar forces you to answer four key questions before you can begin. Who is the main character? What is the main character trying to accomplish? Who is trying to stop the main character? What happens if the main character fails? These questions are like the weed-out pre-med courses in college. If you can’t complete them successfully, stop right there. Your idea is not yet ready for prime time. Contour’s Progress Bar lets you navigate not only your outline, but more than a dozen included outlines of commercially successful feature films. Next, Contour forces you to look at the metamorphosis that your character will undergo during the 120 pages of your screenplay. Finally, Contour helps you piece together your story formula, also known as a logline—that one- or two-sentence elevator pitch that successfully sums up your million-dollar masterpiece. Then and only then will Contour commence to guide you through the plot points, sequences, and reversals that comprise your script’s three acts. Though the application is very stable and easy to use, some aspects of Contour’s interface have the feeling of a work in progress. Things like spelling errors in the interface text don’t impact functionality, but they’re still irksome. Likewise Contour offers a handy Ideas button for quickly capturing those eureka moments, but provides no way to print or export your ideas. I also found that Contour’s export to RTF for use in other apps often yielded odd formatting, such as text spilling off the page. Can you fix it in Microsoft Word? Yes. But it would be nice if you didn’t have to. Mariner plans to address these issues in a future update. A common criticism of paint-by-numbers screenwriting formulas is that they homogenize storytelling. On the other hand, it’s undeniable that many very successful (and very different) films boast similar storytelling and character development patterns. Some things just seem to work. If you’re trying to finish a big box office feature but your story seems to run out of steam around page 60, Contour 1.1 could help you lay a proper foundation that better equips your story for success. If you prefer spending weeks working on backstory and character development for your Altman-esque ensemble film, you might find Mariner Software’s Contour too plot-centric for your taste. But regardless of whether your scribe idol is Joe Eszterhas or John Cassavetes, there’s no harm in giving the Contour story system a test drive; Mariner Software offers a downloadable, free, full-featured 30-day demo.